Upstairs in a nondescript tong lau (walk-up tenement building) on a busy Sham Shui Po market street selling cheap electronics is 100ft.PARK, a small exhibition space organised by a group of three artists/arts workers. The space is supported by an architect whose office is unseen in the front of the unit with access through a semi-concealed door. 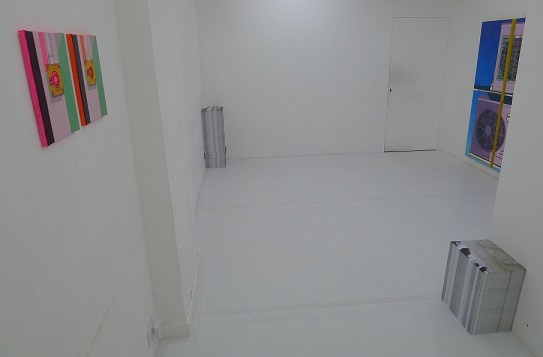 The exhibition area is now a little bigger than the original 100 square foot of their first Sheung Wan space - but not by much! It is perfect for small exhibitions, art ideas, installations and explorations; and it does exactly that. Ko Sin Tung and Stephanie Sin’s ‘Form Simultaneity’ recreates two exterior types familiar to anyone walking around Hong Kong. Ko’s installation, Standing (in the old ways), has the entire exhibition space covered in tarpaulin to give the impression of a construction worksite. 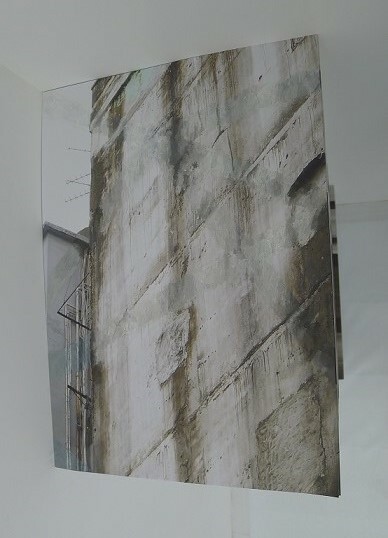 Placed around the room are three piles of posters each with three different images of an exterior wall impressed with an outline of an adjacent demolished building. * The top poster of each pile has been subtly painted by Ko: she has painted-out the steel framework that would support an empty site’s adjacent walls after a building’s demolition. Ko’s sparse installation focuses viewers’ attention on Hong Kong’s heavy-handed urban development (often touted as ‘regeneration’) that destroys Hong Kong older areas, low-rise buildings, and businesses, restaurants and shops that have been operating for generations. The newer replacement buildings invariably do not improve the local environment and new upper/middle-class residents move in forcing out established residents. 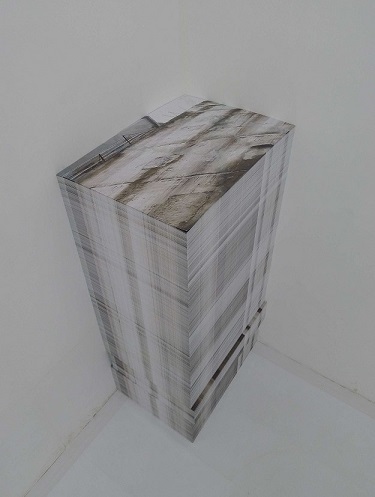 Ko’s installation is barren, similar to the desolation seen after the demolition of a building – and, an empty tract of land will often lie idle for years awaiting the start of a new development at the pleasure of property developers who sit on land banks awaiting the most financially opportune moment to begin. The vertical poster piles could, if we blink quickly or squint ignoring their bad square-box design (and Hong Kong buildings really do have similar aesthetic and design faults), be high-rise buildings. Stephanie Sin highlights Hong Kong’s ubiquitous split-type air-conditioner condensers that protrude and happily sit-out from the walls of a building. Air-conditioners are entirely utilitarian and are not designed to be beautiful or admired. Sin, however, displays them as a highlighted architectural detail. 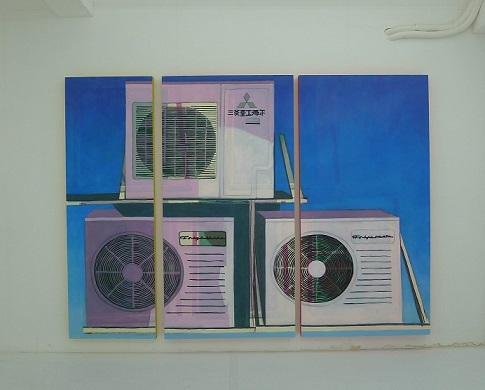 She exhibits Apliu Outdoor Units 01, a three-panelled painting that sits amidst Ko’s building site installation on an interior wall replicating the exact three air-conditioners sitting on 100ft.PARK’s exterior wall. It is an intriguing genre painting whose appearance is saved by an overtly iridescent aura. Sin has painted the air-conditioners as caught by evening’s changing sun-set colours. 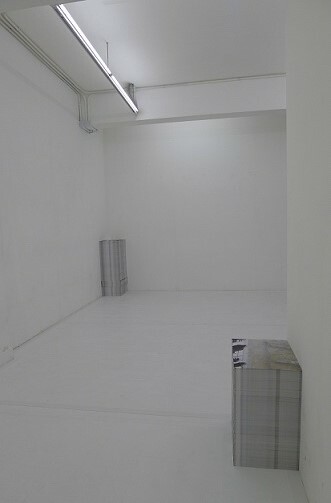 The result is a psychedelic rendition of blues, whites and reds and clashes with Ko’s cool installation. The juxtaposition continues with two small paintings, Apliu Outdoor Switch 01 & 02, depicting the clunky swivel/emergency stop switches that always sit alongside air-conditioners. These paintings are placed near the gallery’s front door and – oddly – give the entire room a symmetrical balance of colour and manipulated space. Sin and Ko are friends, both with studios in Fotan’s industrial area. They joined with curator Andre Chan to bring a little of Hong Kong’s exterior and the city’s development pressures into 100ft.PARK’s interior. 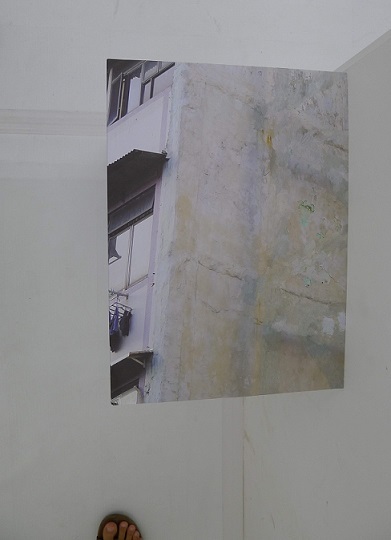 The result was a quietly intelligent observation of Hong Kong’s urban landscape.